In his press conference yesterday, ECB President Mario Draghi signalled that the central bank's monetary policy will diverge from the Fed's for a prolonged period, thus acknowledging the shared currency's weakness. The result was a resumption of the euro's slump against the dollar, with the pair closing 21 points lower and reaching a 9 month low at $1.3363. Just as Italy fell back into recession, German factory orders saw their largest drop since 2011, raising fresh concerns over the Eurozone's economic health. This meant that forex traders were reluctant to commit too much ahead of the ECB's interest rate meeting, keeping the shared currency largely in check around $1.3380. The shared currency touched a new recent low yesterday, dropping 46 points against the dollar to $1.3375, a level not seen since mid-November last year. The fall was sparked by a disappointing Eurozone services number, which expanded by less than initially forecast, fuelling ongoing concerns that the recovery is stumbling. In addition, the conflict in Ukraine seemed to escalate, with fresh headlines about a build-up of Russian troops on the border. The story just refuses to go away despite elections in Ukraine and repetitive sanctions adopted by the US and the EU against Russia. Whilst Portugal's rescue of Banco Espirito Santo helped to ease concerns over the wider banking industry, some think that ECB President Mario Draghi may decide to combat deflation concerns by loosening monetary policy further. Therefore, ahead of the European Central Bank meeting this week, investors continued to short the common currency, pushing the EUR/USD pair 10 points lower to $1.3421. As the US nonfarm payrolls data disappointed, market participants were quick to speculate that the Fed will delay raising interest rates. 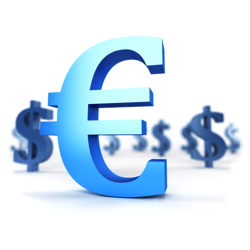 In turn, investors rushed out of the dollar, pushing the EUR/USD pair 33 points higher to $1.3422. Later this week, the European Central Bank will come under scrutiny at its own interest rate meeting.